Taipei, Jan. 28 (CNA) President Ma Ying-jeou reiterated Monday his peace initiative for the disputed Diaoyutai Islands in the East China Sea, calling for cooperation on exploring resources while reasserting Taiwan's sovereignty over the uninhabited islands. 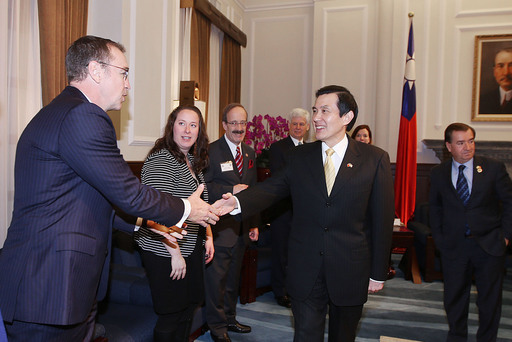 "Many Americans do not know that actually, those islands belong to Taiwan," Ma said during a meeting with a U.S. congressional delegation headed by Representative Ed Royce (R-CA), chairman of the U.S. House Committee on Foreign Affairs. "The island group is a lot closer to Taiwan than to either Japan or China and the island chain has been included as part of Taiwan's territory since the 17th century," Ma said referring to the other two countries with sovereignty claims. "Therefore, Taiwan is also a claimant in the dispute," he said, adding that he first proposed the peace initiative Aug. 5, before Japan purchased the island group from its private owner. "We propose to resolve the dispute via peaceful means, dialogue and negotiation, and we deeply believe that while our sovereignty cannot be divided, our resources can be shared," he said. Ma's peace initiative calls on all parties involved in territorial disputes to refrain from hostile actions, put aside their differences, not abandon dialogue, observe international law and resolve the disputes through peaceful means. All parties should also seek consensus on a code of conduct for the East China Sea issue and establish a mechanism for cooperation on exploring and developing resources in the region, Ma suggested. Meanwhile, he went on, the long-stalled talks between the U.S. and Taiwan under the Trade and Investment Framework Agreement (TIFA) will be resumed soon, which will represent a major step forward in bilateral relations. He also expressed hope that once the talks resume, Taiwan will be able to join the Trans-Pacific Partnership (TPP), a proposed free trade group of Pacific-Rim countries. However, he also noted that Taiwan's market has not been liberalized enough and that it needs to work harder to sign trade deals with countries like Singapore and New Zealand to create conditions that are favorable to helping Taiwan gain entry to the TPP.